I’ve spent the last few days trading breakouts which are showing a lot of promise. It’s very different from dummy trading and I’m interested to see whether I can do both simultaneously. So far, the breakout trading has more than made up for my mediocre dummy setups that I’ve taken. I feel a little like Tyro did in December. It’s been a fun few days. As my StockTickr Calendar indicates, I made over 6R today, but my profits aren’t as much as my R levels indicate – my position size was about half what it normally is (which is pretty small anyway, in my opinion). 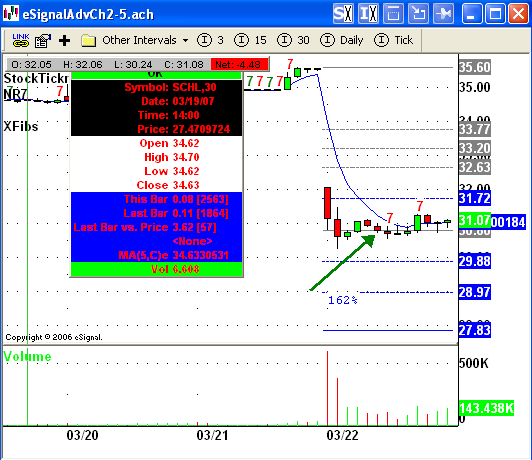 Here’s the chart of SCHL, my losing dummy/fib setup today. I normally set my stops for Shorts to cover if the Ask increases to a set amount. For Long positions I use the Bid. Twice this month I’ve been stopped out on a Short when the spread (which was typically 1 or 2 cents) jumped to over a dollar without any trades being comsummated. Had I used the last trade price I would have made some money. What do most Day traders use when setting stops — Ask, Bid or Last price???? Heh, I’ve been meaning to post an update. I went back to HCP since they seemed to have the best system for day trading, and I wanted to introduce a friend to it. Since then, I’ve put the time and effort to make it my own and I’m loving it. I’m thinking of adding in Dummy trading, so it looks like we’re finding the same solutions, just from different sides. And hey, 6R is never a bad thing, even on half size. I just got stopped out again on an ask that did not trade. My stop was 17.50 (.5%) the high for day so far is 17.45. As I type I’d have a $200 profit had I not been stopped out. The daily volumn on the stock is 305,700. Man this is the pits. Don’t know yet if I like trading. I’m not doing nearly as well with my “Trading Funds” as I’m doing with my much larger “Investing” porfolio. SCHL-I only see a dummy trade 3/30 not 6/30, and I guess the Chairman would short the downside break and not bother twith an upside, unless it hit a previous X Style 1.38 ext and is now moving up. It sounds like you’re really good at picking resistance levels – too good, maybe! 300,000 shares for daily volume is on the small side. I’d say most daytraders look for daily volume of at least 1 million shares. SCHL was an X style fib play of the break of the OR low.